Category Archives: airdale brewing co. Things have been rather slow around here for the past month or two, though it should pick up rather quickly with the upcoming release of Russian River Brewing Company’s Pliny the Younger later this month (like last year I plan on updating a list of bars serving PtY, please send me an email if you hear what bars are putting it on and when). On a sad note West Coaster has a blog post about Airdale shutting down. Technically Airdale wasn’t a San Diego brewery, they contract brewed at Bayhawk, but they were a San Diego company. I always enjoyed their Dark and Stormy Imperial Stout, it’s sad to see them go. Speaking of West Coaster, the February 2012 issue is out now, I have a column about the big beer companies trying to move in on the craft beer space. You can read it online here or better yet, pick it up at your favorite watering hole. This Sunday is the Super Bowl which also mean’t it’s Stone Brewing Co.’s Winter Storm. Ton’s of great Stone beers on tap and in bottles including plenty of vintage releases. The Calm Before the Storm breakfast is sold out, so show up at 11am. Check the link for more details and the full tap/bottle list. Today kick’s off Poway’s Phileas Foggs‘s Fogg-a-Palooza, a four day celebration of San Diego craft beer. The beer lineup they’ll have on throughout the weekend looks great (a few examples: Lost Abbey Ad-Lib and Karl Strauss 22nd Anniversary Vanilla Imperial Stout). In addition to all the great beer a few brewers will be stopping by throughout the weekend. Tonight it’s Ballast Point Brewing Co. Lead Brewer James Murray. Check Phileas Foggs website for the full lineup. Hamilton’s Tavern will be hosting Grand Teton Brewing Co. for Firkin Friday this week. They’ll have Sweet Grass APA in the firkin with plenty of other treats on tap. There should be something for everyone but a few that standout to me: Barrel Aged Tail Waggin Double White Ale and Who’s Brett Dark Sour, I haven’t had either of those but I’m definitely intrigued. I have no idea where the Hamilton’s Tavern Mystery Bus will be going, but I’m sure there will be beer. There are two trips, at two hours each, both leaving from Hamilton’s Tavern. Sign ups are at the bar on a first come basis the day of. The first bus leaves at 1:30pm and the second at 4pm. Stone is hosting Chef Celebration, a nine course beer and food pairing festival. Nine local chefs will serve food paired with 18 local beers (paired by Dr Bill) out in the Stone Brewing Co. World Bistro and Gardens. Proceeds help fund a scholarships to send local students to the Culinary Institute of America. Check out the full menu here and buy tickets here. As always Monday night means $3 local pint night at Toronado. Up in Carlsbad the Twenty/20 Grill at the Sheraton is doing a weekly series called Brewsday Tuesday. This week they’ll have Oceanside Ale Works on hand. No word on what they’ll have on tap but they’ll have some featured beer on happy hour special all night. Head on out to Main Tap Tavern in El Cajon where they’ll have Airdale Dark & Stormy on cask. They’ll also have some ice cream on hand if that’s your thing. 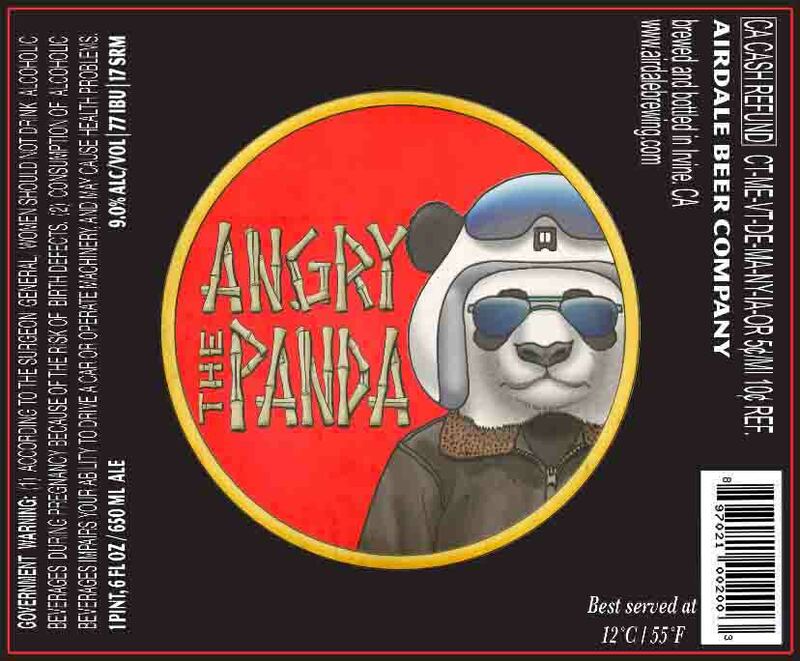 The Angry Panda | Airdale Beer Company Coming to Bottles? Just what is The Angry Panda? Their website popped up a few weeks ago (along with a Facebook Page and a Twitter account) but didn’t provide much information other than: “Coming Summer 2011”. The domain was registered to Airdale Brewing Company, the San Diego based company that brews their beer at Irvine’s Bayhawk Ales. According to their website Airdale Brewing Company has four year round beers and two seasonals of which I have only had their Dark & Stormy Imperial Stout and Homecoming Spiced Porter. It’s been a while since I had them, but I remember liking both, especially the Dark & Stormy. Currently Airdale is only available on draft (and I think only in San Diego county edit: according to their Facebook Page they recently became available in Orange County as well) but that may soon be changing. I recently received this 22oz bottle label for The Angry Panda, a 9.0% ABV, 77 IBU, 17 SRM (SRM is the measure of color in beer, meaning this is probably dark amber or light brown). No word on what the style will be, but based on those numbers it could possibly be an Imperial IPA or Imperial Pale Ale. Although the “Best served at 12C/55F” seems a little high for an Imperial IPA so your guess is as good as mine. Know more about The Angry Panda? Leave a comment below. Durango, Colorado, where I’ve lived for the past year and half, isn’t a bad place to be a beer geek (check out my old beer blog from Durango). But it’s not San Diego. It’s also in the middle of nowhere. Durango has four breweries and but it’s also about 300 miles from Denver, which means the many beers brewed in the Front Range, and those from out of state breweries that get distributed in Colorado often don’t make it down here. I don’t mean this as a complaint about Durango but rather a way to show how excited I am about returning to San Diego. Below are ten (of the many) beer related reasons I’m glad to be back. Hanging out on the patio at the La Jolla Brew House with my dog. The patio at La Jolla Brew House isn’t a bad place to drink a beer, and it’s made all the better because I can bring my dog. Firehouse Brewing Co.’s beer garden is also dog friendly so I’m sure we’ll be enjoying some pints there too. Before I left San Diego Hamilton’s allowed dogs, if anyone knows if they still do please leave a comment below. Festivals and Events: Summer typically means beer festival season no matter where you are, and because of the number of breweries and beer lovin’ folks in San Diego, there are plenty of festivals. Pizza Port’s Real Ale Festival, Stone SourFest, San Diego International Beer Festival, San Diego Festival of Beer, San Diego Beer Week’nd and Stone’s Anniversary and Invitational Beer Festival. I’ve probably left a few out, but those are the first that come to mind. QUAFF: Quality Ale and Fermentation Fraternity is a San Diego based home brew club. Their member’s beers have won numerous American Homebrewer Championships over the years. I’m excited to check out and join the club and hope I can learn some skills to further my home brewing. Beer Box Tijuana. Sure Tijuana isn’t San Diego, but to me they’re inseparable. I came across Beer Box Tijuana while visiting friends and was amazed at their beer selection. In Tijuana terms (where Tecate pretty much rules to the city) they have an impressive beer selection. They have a good selection of San Diego craft beers, but of more interest to San Diegans they have plenty of Mexican craft beers that don’t get distributed in the US and many beers from Europe. In addition to all that the folks at Beer Box Tijuana are homebrewers and often host homebrew club meetings and tastings. Beers: Regardless of everything else, beer blogging is about the beer. And there are plenty of beers I haven’t been able to easily get out here in Durango that will be much more accessible in San Diego. Here’s a short list of some I’m most looking forward to: Alesmith’s Speedway Stout and Grand Cru, Port Brewing’s Old Viscosity, and so many Lost Abbey beers I’ve never tried. Stone Bistro and World Gardens: This is one of my favorite places to have a beer and eat dinner. And since it’s all the way up in Escondido I don’t make it up to often, which keeps is special and ensures it will never become ordinary. I’m hoping to make it up for a few movie nights this summer as well. The beer bars that have opened in the last year or two: Blind Lady Ale House, Small Bar, The Station, Ritual Tavern, Toronado just to name a few. I’ve been to BLAH, Small Bar, and Toronado but I’m looking forward to spend far more time at each. The Liquor Stores: South Bay Drugs, The Best Damn Beer Shop and Keg N Bottle just to name a few. The beer selection at these stores is phenomenal. I’m like a kid in a candy store every time I walk in. The Newer Breweries: I’ve never had any beers from Airdale Brewing Co., New English Brewing Co., or Mother Earth Brew Co. There are plenty of other small breweries that have opened tasting rooms or expanded their lineups recently. I’m excited to try them all. Tap Hunter: Tap Hunter is one of the coolest ideas and websites around. I’m sure every San Diego beer geek already knows and uses it (if you don’t click the link above to check it out) and now I’m happy that I’ll be able to also. Tap Hunter launched shortly after I left San Diego last year. What Tap Hunter does (in a nutshell) is crowd source a list of what beers are on tap at various bars and restaurants. You can check the website before you go out to see what is most likely on tap and use your smartphone to report corrections if a new beer has gone on tap or a keg is empty.